By simply choosing "Add channel", an email channel is easily set up. Once this has happened, it's a matter of refreshing the page and the message can actually be forwarded or answered. Handling email in this way has a number of advantages. 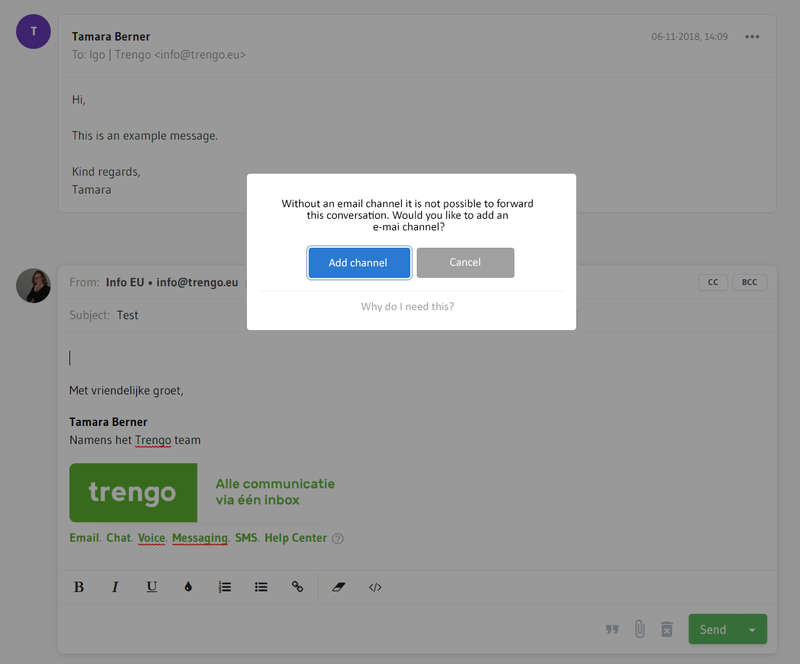 For example, it's possible to forward received email to another recipient; messages can be sent to multiple recipients by using CC and BCC and every Trengo user has his/her own signature at the bottom of the message. In addition, a forwarded conversation is processed together with all responses as one conversation. Lastly, email fields are automatically filled by searching in the information from existing contacts. As soon as an email message is assigned to someone, an email format is automatically created which can be used to answer the email. Sometimes, there's the need to forward an email directly to a third party. If the third party is a colleague, then this email conversation can easily be assigned to this colleague. In other cases, an email must actually be forwarded as an action in itself. The sender and receiver are already filled in and the signature of the user has been created. However, in this case the recipient isn't correct, because the recipient is the person who sent the message automatically. By simply placing the indicator on or behind the address of the recipient, it can be removed. By typing the name of the recipient, or the beginning of their email address, a (list of) suggestion(s) for recipients automatically appears. It's only a matter of selecting the right person and sending an email message. If an email conversation consists of multiple messages that are sent back and forth, these are conveniently merged into one message. To ensure that this does not take up the entire screen, the conversation is displayed as being "closed". By clicking on the three dots below an email message, the entire conversation is then displayed. Nice and clear!